You may have a position up for election with more than one vacancy, and more than one candidate running for the vacancies. This is common in elections for board members, or for any other position that has a group of people with a shared job in an organization. Electionbuddy allows you to set up a ballot question for these situations quickly and easily, and even allows you to specify whether you want your voters to vote for the exact number of candidates as there are vacancies, or if you want to allow them to choose candidates up to the number of vacancies. In stage two of your election setup, the "Ballot" stage, click the "+ Add position or question" button. From the window that will appear, you can either select the second option ("Multiple candidates for 2 or more vacancies — eg. vote for 3 of 5 directors:"), or start with a blank question. If you select "Multiple candidates for 2 or more positions — eg. vote for 3 of 5 directors" option, you will be asked to set the number of candidates, and then set the number of available vacancies. If you try and select more vacancies than you have candidates, an error-checker will notify you of this and prevent you from proceeding. The ballot question will be created - you can input your ballot question title, as well as your candidate names. If you start with a blank question, set your voting method to "Plurality". Fill in your election specifics (ballot question title, candidate names, profiles if applicable). You will see a statement below your candidate list that tells you how many candidates you have, how many vacancies you have, and how many candidates voters choose from ("exactly" vs "up to"). The vacancy number and how many candidates voters choose from are adjusted in that statement; the candidate number is adjusted by adding/removing candidates. Enter the number of candidates you want your voters to vote for, and the number of vacancies you have for the position. 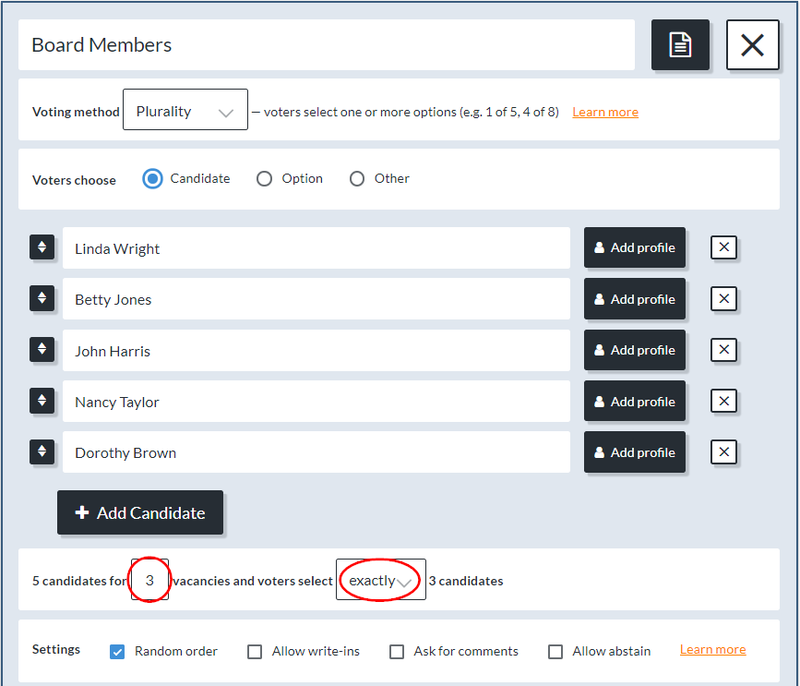 Add your candidate profiles or extra instructions (optional), and adjust any other settings for the ballot as required (abstains/shuffling candidate order/write-ins). If "exactly" is selected, voters are required to select exactly the same number of candidates as there are vacancies to successfully submit their ballot. For example, if you set up your ballot for voters to select exactly 3 of 5 candidates, then voters must select 3 candidates to submit the ballot. If "up to" is selected, voters can choose any number of candidates to vote for, up to the number of open vacancies for the position, to successfully submit their ballot. For example, if you set up your ballot for voters to select up to 3 of 5 candidates, then voters can select up to 3 candidates to submit the ballot. They could successfully submit their ballot with only one candidate chosen. Your ballot does not necessarily have to be a plurality question when you have multiple candidates for multiple vacancies. Plurality is definitely the most common option, but depending on your bylaws, you may be required to satisfy this another way. To use one of these alternative voting systems, simply click on the drop-down menu where you see "Plurality", and select the voting system you like from the drop-down options.